C. Bissell Jenkins, the originator of the reclamation project that led to the completion of Murray Boulevard and other streets in this area, became the first to build a residence on the new, grand thoroughfare." ..."the house remains the most imposing of Colonial Revival style dwellings built on the peninsula in the early-twentieth century." 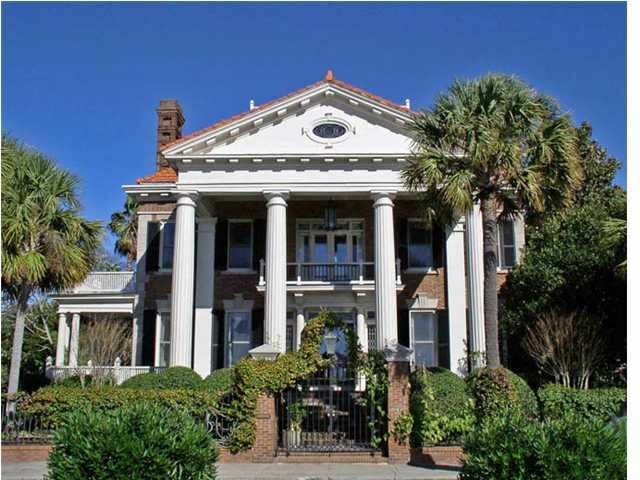 Jonathan H. Poston "The Buildings of Charleston: A guide to the City's Architecture" This Colonial Greek Revival home on a large double lot was originally built as one of the grandest homes in Charleston, and remains today as the Grand Dame of Murray Boulevard, and an important home in Charleston. 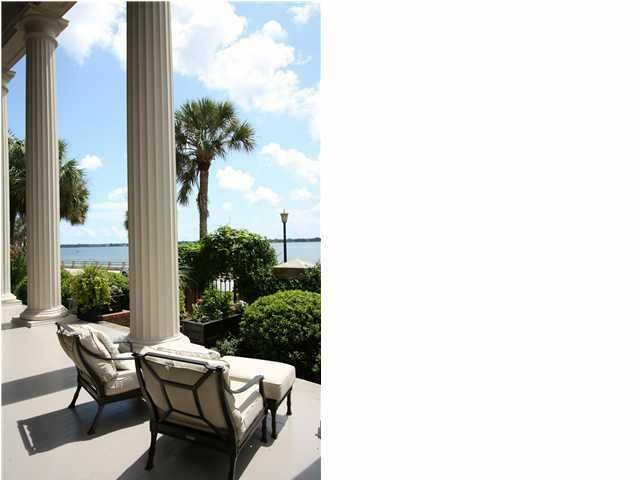 Standing on the exceptionally large Tuscan portico, you are taken back with the breathtaking, panoramic views of the Ashley River. The reflection of light into the grand marbled and columned foyer enhances the large, elegant Living Room and heavily detailed Dining Room with incredible light. The grand staircase through the center of the house separates the wormy chestnut finished paneled library and the updated enormous kitchen with chef's wood burning cooking grill. The kitchen has custom cabinetry, high end appliances, and a pillow edged limestone floor. It leads into a bright, large family room with a stone fireplace, limestone floors and a full bar area. Continuing up to the grand second floor landing, you enter a Master Bedroom with an office enclave and front balcony that enjoys magnificent panoramic views of the River. The Renovated Master Bath is oversized and has a separate shower and bathtub and a large dressing area finished in marble. The master suite also includes abundant closets and an exercise room. The second floor additionally houses a fabulous guest suite which takes full advantage of the amazing water views. This lovely bedroom contains a large marble bath, fireplace and a private access to the second floor side piazza. 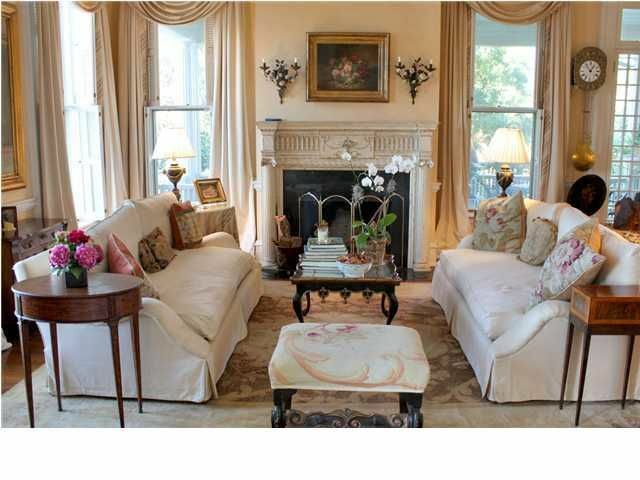 An elegant private study with large windows and a fireplace is also located on the second floor. The third floor contains a large landing area, 3 additional generously proportional bedrooms (2 with water views), a new full bath that was recently added to the property, a second sizable bath, and a room sized cedar closet. From the third floor there is access to a full roof top deck with some of the best views in Charleston. Enter the lovely landscaped gardens from the piazzas or the steps off the family room and find 2 private garden rooms and a large, private pool area with loggia. This property is totally secured by a brick and wrought iron gate wall crawling with beautiful ivy and fig leaf. Enjoy the breezes and views of the water sitting on the shady,side piazzas which extend from the first and second floors. There is parking for at least 4 cars. 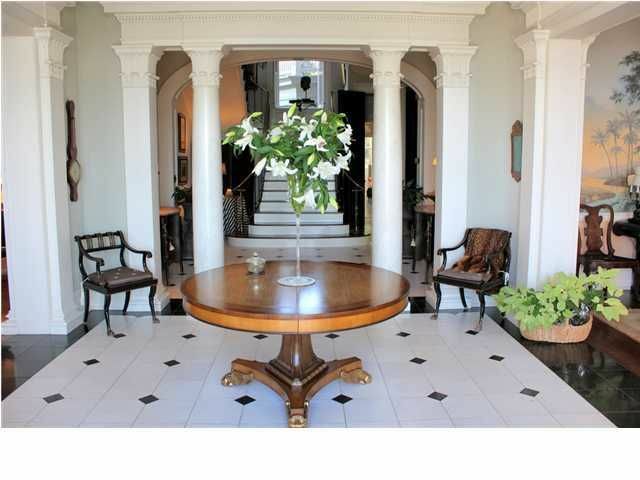 Noted architectural features include an exterior constructed of Summerville brick trimmed in limestone, a Ludivicchi tile roof, and an interior of beautiful woodwork, a grand central staircase, original windows, 8 working fireplaces, as well as heart pine and natural stone floors throughout. Facade Easement with Historic Charleston Foundation.